It’s been a while since we posted anything of substance, and it’s beyond time for this one because we have one particularly loyal reader and friend who deserves more than a list of what we’re eating for dinner each week. I don’t promise that it will be our best post, and it certainly won’t compare to the literature our friend is reading these days, but it’s written with love, admiration and respect for a guy going through something incomprehensible, with intractable grace and dignity. (Yes, I had to look up the definition of “intractable,” and yes, if there is anyone who embodies “difficult, stubborn” grace and dignity more than our friend, such a person would be a good one to know.) Although I haven’t been inspired to write much lately, dusting off the blog as a way to let our friend know we’re thinking of him seems like the right thing to do, and I know I’ll be glad that I did. Similarly, I am often uninspired in the kitchen, yet the meals I’ve made when cooking is the very last thing I feel like doing tend to be the most satisfying. Like that time I spent all day painting our living room and dreaded having to cook dinner, until I remembered this delicious, quick and crazy-easy pork chop recipe. I whisked up the marinade, cleaned up my paint supplies while the chops infused with Asian flavor, and about half an hour later we enjoyed a meal that tasted like I’d spent hours in the kitchen. Totally worth it. 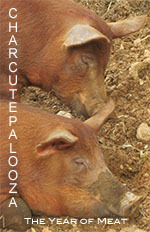 So why do we refer to these as “Get Real Into It” pork chops? Long story long, because we watch a lot of television and have fun with inside jokes/stories related to our food. In addition to singing competition reality shows, one of our favorite TV genres involves cooking competitions. We particularly enjoyed the first season of Best New Restaurant, in which restaurants compete against each other in a series of challenges involving food, quality of service and hospitality. The show also features “secret diners” who visit each restaurant and secretly record their dining experience. One such secret diner recorded his server announcing “You’re about to get REAL into that pork chop” when she delivered his big-as-a-plate, bone-in pork chop. We thought it was hilarious for some reason (rewind and re-watch multiple times funny), and the statement stuck with us. We borrowed the phrase for this recipe because we’re real into how good these pork chops are, especially considering how easy they are to make. Use a fork to pierce the pork chops all over. Place the chops in a resealable plastic bag, add the marinade and swish it all around to coat the chops. Seal the bag and let the pork chops rest at room temperature for about 20 minutes, turning the bag occasionally. Remove the chops to a plate (but save the marinade) and lightly season them with salt. In a small saucepan, bring the marinade to a boil, then simmer until it reduces into a thick sauce. Heat about a tablespoon of vegetable or canola oil in a large, nonstick skillet and cook the pork chops until they are browned on both sides and cooked through. The cooking time will depend on the thickness of the chops. Thin pork chops will be done in just a few minutes per side, and thick ones will take longer. We cook pork until the internal temperature reaches 140-145 degrees, mindful that the pork will continue cooking a bit even after removed from the heat. It’s more difficult to accurately measure the temperature of thin pork chops, so you can check whether they are done by cutting into the thickest part of the chop to make sure it’s no longer shiny pink inside. A pinkish hue is fine, but shiny pink means the pork is not quite done yet. Spoon the sauce over the pork chops and serve. 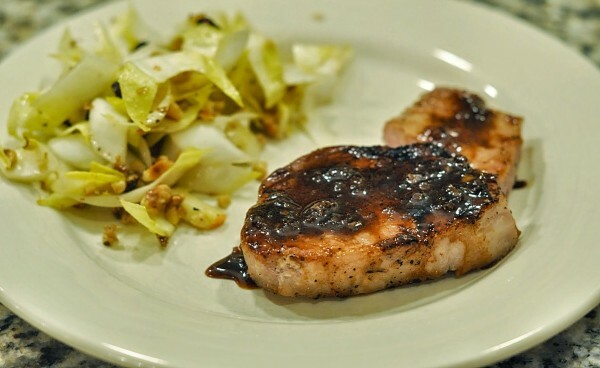 On that night, we paired the chops with a salad made with endive, walnuts and apple for a decadent weeknight meal that could not be much easier or quicker to prepare. Time is precious, and we will always wish we had more of it. Because it is so fleeting, we recognize the need to live life to the fullest—to get real into it—and we will be forever grateful for the friend who inspires us to do so. Your unnamed friend is blessed to know you and Dan because you both give love and support so unselfishly and so totally from your hearts. Blessings to all of you. as resources from the Google Analytics group. I had so much to say, but I think “deck refinishers” really summed up the moment. Anyway, I believe that I am the friend, but this is the first I’ve heard of this intractable thing. Sheesh, wish someone would have said something before know. But you guy have have always been great and wonderful to me—though apparently we differ on Oxford Commas, which makes further friendship really hard for me. I’m so grateful to have know you both this past decade plus. Other than the disappointment at missing out on “Friday Favorites,” it’s all been great. You are special people. Even you mother agrees, so it much be true. Love. Loved the Pork chops and made the celery salad and wasn’t sure about it but was a wonderful together. Try Red Boat fish sauce it cost more but worth it.Love your blog!! Thanks Lyn! We’re so glad you tried the chops and the salad and liked them. We appreciate the comment, and the fish sauce recommendation – we’ll try it!